And what happened to Farrers acting career? He lives in America and is a professional poker player if stories are to be believed. I think he's pretty loaded. There was a rumour he won the lottery but actually didn't from what I remember. The rumour he won the lottery was around the same time he was doing FWA shows as a manager in 2003. John farrer used to be on ch4s late night poker if im remembering right always wore shades and had a goatee. i went to this "show" like a bloody idiot i agreed to drive my two mates from Rotherham on the premise that at last i woudl get to see some wrestling so didnt mind staying sober. I remember Jody coming out on the stage offering to take Trent on in a match with no ring - didnt buy that one as figured that if one match took place then no refunds would be due so got money and headed to the pub across road. yay for me i got to stay sober while my mates got pissed and played jenga for 2 hours, to top it off i got flashed by the speed camera's when we left and had to go back and do a speed awareness course. Alex Shane was "Sgt. Ducky"? God to think i nearly made the trip to see this. Great read mate, enjoyed finally hearing bout this is detail. You're right about York station, it's bloody cold at that time of day.. Me and the Mrs arrived home from Manchester on New Year's Eve around the same time.. Was frozen solid by the time we got home lol. Well it's been a hectic few days.. I'm here, good and well (theoretically speaking). I was not arrested and I am not bankrupt, although I probably would have gotten a better night's kip in a cell! I'm just here now to show my face, I'm not hiding, I am personally answering all calls on the ticket hotline. I'm just here to tell you what happened from my perspective and clear up a few things. Let's not beat around the bush and talk about the ring. Simon (Steve Lynskey) you are LYING, although I don't know how much is truth and how much isn't. When I first booked the show, I booked Jake's 20x20 ring, based down south. So then I am told Jake's ring has been stolen (I'll cut the story short on that one I don't know what happened) - then I hear it is in Steve Lynskey's possession, ask what's going on and got fed some story I'd rather not go into.. so I ask whether the deal is still on. I am told it is not, as the ring needs new wooden boards, so I had to find another one. So I phoned up Jem from Brawl, who has a Highspots 16x16 ring in Northampton and booked him for that. Jem would have been here it was just a case of whether we were using his own van or a hired van. Everything's cool and I wish it was left at that, but oh no..
Dunno about that but Sammy Farha is awesome poker player. I hope its true for comedy purposes. I don't know for certain, but I can absolutely believe the title-promo thing being the cause of it. Shane's a bizarre guy with some really funny ideas of what's important. I think I may have shared my experience of this night a few times, certainly to Sheffbag. The thing here is it was a sad day as there were probablly around 500 people knocking around in and outside, I nearly ran over Kenny Morrison the old SCW promoter. I wonder how many of them never bothered with a British Wrestling show again. As you can see from when I joined this forum, it was this event that led me to the forum. I remember it all so well, it's almost like HatGuy is telling my recollection of it. Only difference is I came all the way from Chelmsford in a coach with about 12 other fans, most of whom we picked up in London. We ended up getting back to Chelmsford at whatever time in the morning and I was introduced to this forum right then! I'd been a fan of British Wrestling for a bit over a year, but this would have been the first time I'd ever travelled for more than about 90 minutes to see a show. I only knew about it from the ads in Total Wrestling, but had been told by some members of this forum who I knew that it would be well worth going to, and the coach trip made it affordable. Phil Austin, Chris Roberts, Andy Quildan and some others were in the coach too. We had fun on the way up. Went to crap once we got there though, most of how I remember it is just like HatMan said. I was hoping to find some pictures I took that day, as I know I took some, including the broken table, the DDT on the stage, and the toy ring in the middle of the hall, but all I could find was a photo of everyone miserable getting back on the coach. This was my first britwres show. Gutted it didnt gk ahead but enjoyed drinking with trent acid etc whilst waiting. I still have the programme! Can you spot yourselves in the crowd? I want to see the picture of this 'WWF Toy Ring'. 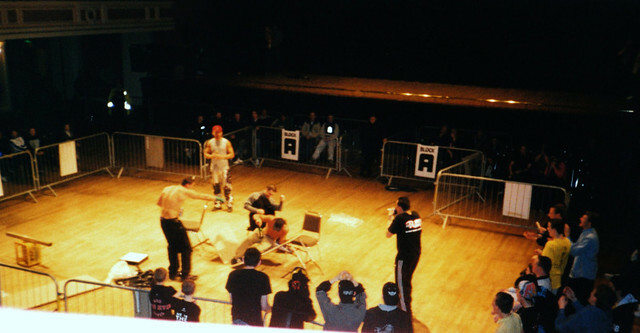 First and last British Wrestling show I ever attended. I remember Jake Roberts asking a kid no older than 12 if he had a driving license. Interesting experience.